Photographer Gregg Thompson witnessed a hybrid Glaucous-winged Gull attack a Rhinoceros Auklet. This species of gull is omnivorous, eating a variety of food from fish, molluscs, and crustaceans to birds as large as Rock Pigeons. 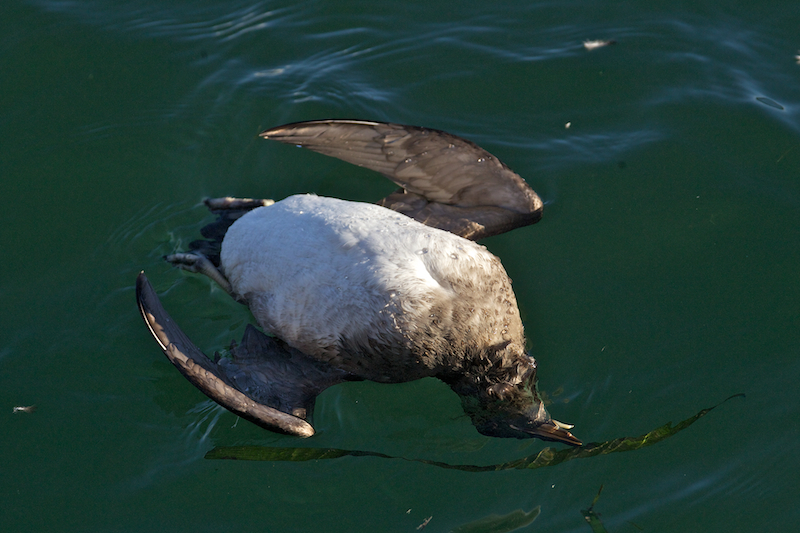 This gull killed the auklet, but left it for dead (as seen in Image 6)--perhaps it proved to be too large. Note that the dark primary tips (darker than its mantle/back) indicates that this gull is a hybrid with the closely related Western Gull. BirdNote shows that feature Glaucous-winged Gulls and Rhinoceros Auklets.